The Pyle PCT40 gives you a simple and easy way to make sure your audio cables are working properly. The unit supports nearly all cable types used in the sound recording industry, providing you with an all-in-one solution to help identify cable continuity issues in your audio set-up -- that way you can resolve any problems before important events. With just a turn of the dial you can test if each pin on your cable is working properly. The LED panel features 8 indicators that let you know if your cable has full continuity and which pins are functioning or broken. That way you can repair any broken pins or purchase a new cable while you still have time. Built in a strong, compact metal casing, the PCT40 is made to last, and is a great long-term solution to help keep your audio set-up running smoothly. Front panel includes test dial and LED indicators. Powered by 9volt battery (not included). 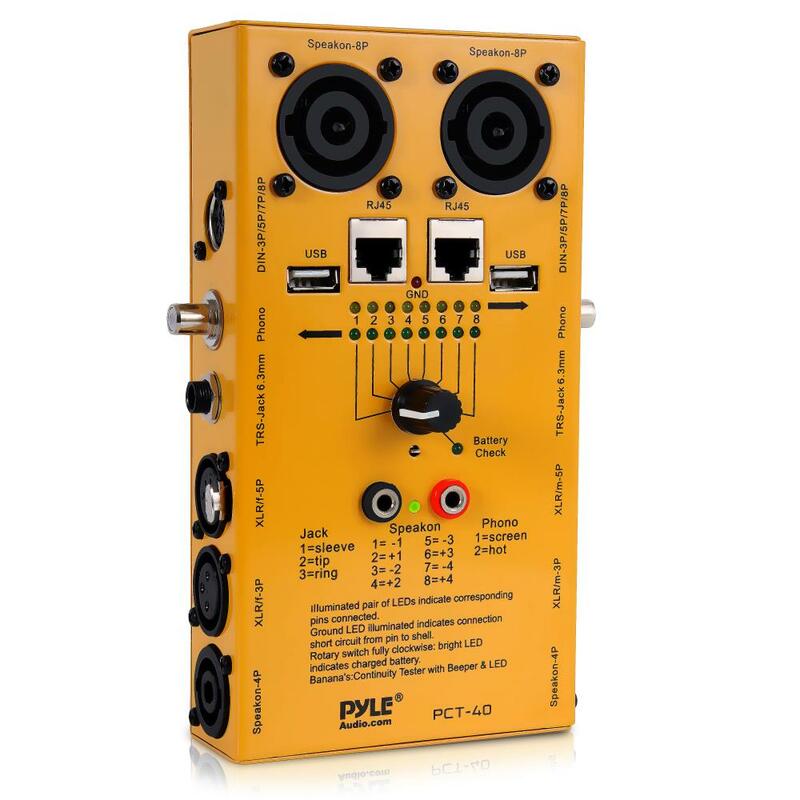 With support for nearly every cable type in the sound recording industry, the PCT40 is your go-to for making sure your next performance goes off without a hitch. Or, you can do a little house cleaning and throw out any cable that's no longer working. Review : The PCT-40 is a great cable tester for the price, with a wide range of connections. It is easy to use. The dial makes it easy to isolate faults if you decide to repair a cable. Review : Solidly built and simple to use. It will be a mainstay in my gig bag. Review : Great product so far! Review : Very usefull and rugged! Review : Awesome cable tester. Everything that you could ask for. Review : Works like a charm. Solved several issues for me on Day One. Review : Tester works great! Unit is well built and checks a multitude of cables for continuity, breaks or shorts. Would recommend to anyone needing cable tester that can check a wide variety of cables and connectors. Review : Great product and easy to use. Review : Just received, so only initial testing done. Very well made case will hold up well. 9V battery fits very snuggly, so shouldn't be contact problems. Pretty straight forward operation, although user guide could be more detailed. Review : Looks like a great item. Just got it out of the box, But tested every cable I could find and works great. Will come in very handy in audio dept at church.